St Peters GLC are a successful and friendly Senior Gaelic football Club based at Hough End Playing Fields,Mauldeth Rd W, Manchester M21 7TG. We welcome people of all levels of ability or if your interested in helping the club in a non playing capacity you can drop us on a line on our various platforms. 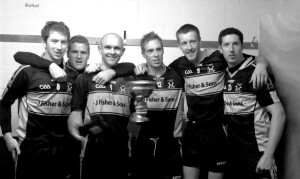 If you are moving to Manchester for work or university and are looking to get involved in GAA in any form, St Peters GAA Manchester is the club to join. The club usually trains twice a week at Hough End Playing Fields (M21 7TG) and games take place either at weekends or midweek during the summer months. The club also has access to indoor training facilities to build up fitness which also provides some variety to grass-based training. 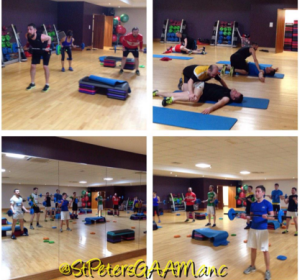 See below for images of the Peter’s lads being put through their paces at David Lloyd gym in Trafford. The Lancashire/Pennine season normally runs between March and September. Following this and depending on results, the All Britain championship runs up until the Christmas. Looking for employment? With the club’s various contacts we can put you in touch with employers in a wide range of industries. 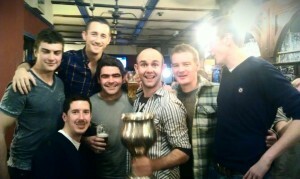 The current playing squad is made up of engineers, teachers, physios and tradesmen to name but a few. If you are interested in playing or just want to meet some new friends, St Peter’s is the place for you!